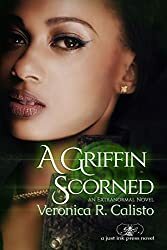 Griffin Scorned by Veronica Calisto is a unique take on urban fantasy, staring a Griffin and a Dragon. Victoria is a Griffin, and she came home to find her boyfriend in the arms of another woman… in her bed. The sight sends her on a rampage. Of course, Mallory Stone is glad she’s there when she saves his life. The two find they have more in common than they thought, since they’re both extra-normals. Of course, Mallory needs Victoria’s help when his brother goes missing. No one can lie to a griffin. And they find the plot is deeper than they thought. I love Victoria as a character because she’s smart and sassy without being cliche or nasty. Griffins and dragons aren’t the normal ‘paranormal’ book scene, and so that’s fun as well. The plot is unique. The writing is tight. And you can’t help but fall for the characters. It’s a perfect blend! If you like the sound of this one, check out A Griffin Scorned on Amazon or via the author’s website.